Botka like Tatar porridge. Botka prepares from groats. Groats here must be clean, well sorted out, washed-up and not to taste bitter. A cachou can be cooked liquid, viscid and crumbly. At cooking to porridge add sugar, oil, milk, creams to liking, salt of and other. Porridge is given usually with a butter, milk and katyk. To pour in the pan of Milk, a bit water, put on a fire and give to begin to boil; to add salt and granulated sugar. Stir slowly, add a semolina and cook about 10 minute. To put the prepared cachou in piattis, pour a butter and to give on a table. semolina - 50 g, milk - 150 g, water - 50 g, sugar - a 10 g, oil - 20 g, salt. Heat an empty pot on the stove, wash the buckwheat with cold water and pour it into the empty pot. Add a big spoonful of butter and roast the concoction for five to ten minutes while mixing it every few minutes. Add salt and then carefully pour water into the pot. Boil the porridge for about 30-40 minutes, mixing it every once in a while, especially towards the end. You can add some more butter, too. The porridge is ready when all of the water has been absorbed. Let it sit for five minutes or so and serve with butter on top. 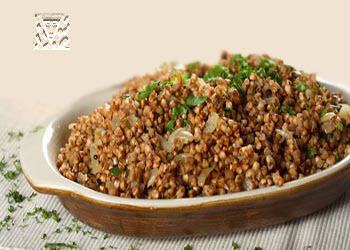 Buckwheat groats - 100 g, water - 200 g, oil - 20 g, salt. Rice - 70 g, milk - 100 g, water - 150 to sugar - a 10 g, oil - 20 g, salt.